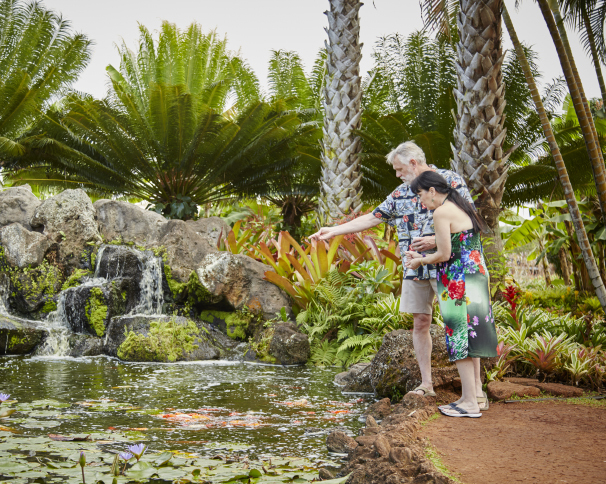 As you wander through Dole Plantation’s eight different gardens, you’ll get an up-close view of the plants that are the source of tropical delights from coffee to exotic fruit to colorful cacao pods, used to make Waialua’s signature single-estate chocolate. Depending on the season, you’ll also be able to smell the delicate fragrance of lei flowers including plumeria, pikake, and pua kenikeni. 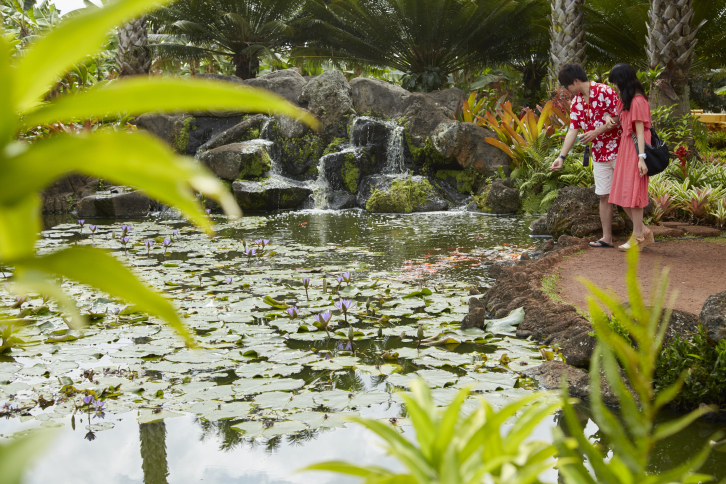 Plus, download our FREE Dole Plantation app on your iPhone or Android device to hear folklore of old Hawaii and much more! Tickets may be purchased online at least 24 hours prior to the day of your visit, or on-site the day of your visit. We’ve come a long way from the plantation era, when fields of sugarcane and pineapple covered whole islands and stretched as far as the eye could see. Hawaii’s new diversified agriculture means that the region from Wahiawa to the North Shore is now a bright patchwork of tropical crops, including banana, taro, sweetcorn, lychee, papaya, mango, coffee, cacao (chocolate), and flowers. Many of these quality products are featured on the menus of Hawaii’s finest restaurants and can be found in stores throughout the world. The native yellow hibiscus (Hibiscus brackenridgei), known as pua aloalo in the Hawaiian language, is Hawaii’s state flower. This plant’s magnificent blooms are beloved of gardeners the world over, and today there are over 5,000 varieties of hibiscus, from traditional solid yellow, red, pink, and white flowers to brilliant and unusual color combinations and shapes. Keep your eye out for refined lavender frills, or flowers that encompass all the hues of a Hawaiian sunset. The Hawaiian Islands are the most isolated land mass on the planet, but before the first Hawaiians came to Hawaii’s shores, these islands were already home to a thriving ecosystem. These special native plants and animals, many of which are found nowhere else in the world, arrived by chance on the wind and sea currents, and evolved for millennia in almost total isolation. 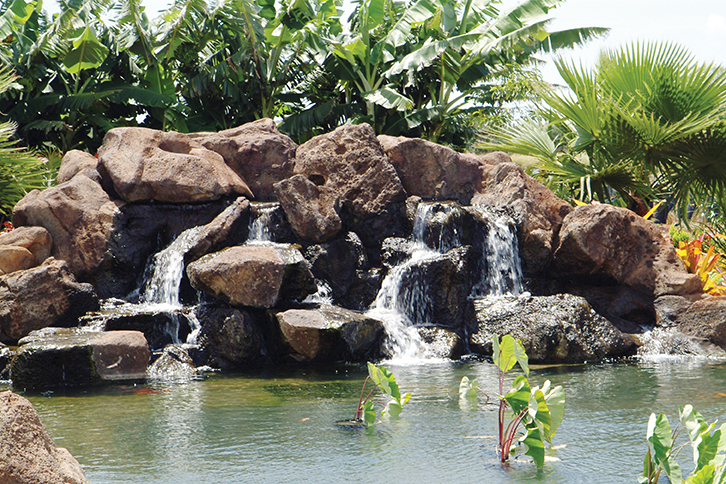 A wide variety of tropical flora and native plants can be found throughout our North Shore district. Here are just two examples. KOA (Acacia koa) Koa, which can take half a century to mature and grows up to 100 feet tall, is one of Hawaii’s most prized tree species. In Hawai`i, the lei, or garland, is a special gift of aloha, welcome, and love. 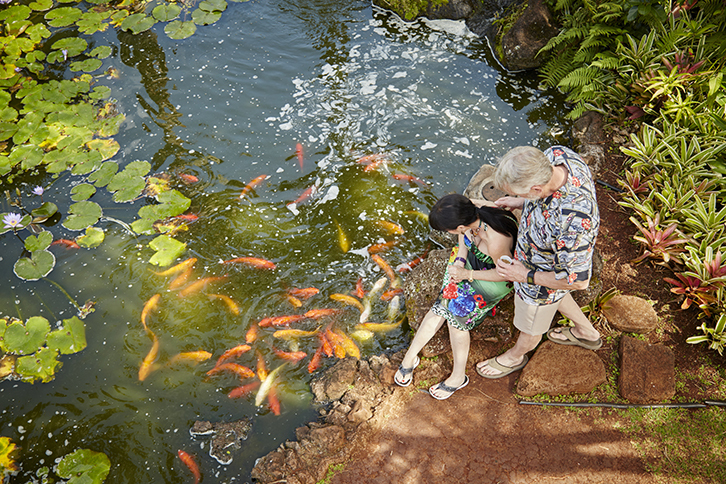 Many visitors receive a lei upon arrival in the islands—always with a smile and a hug. Hawai‘i residents also make and give a lei to honor an achievement, commemorate a special event, or just to express affection. Early lei in Hawai`i were often durable, made of painstakingly harvested shells, bones, feathers, and plants. 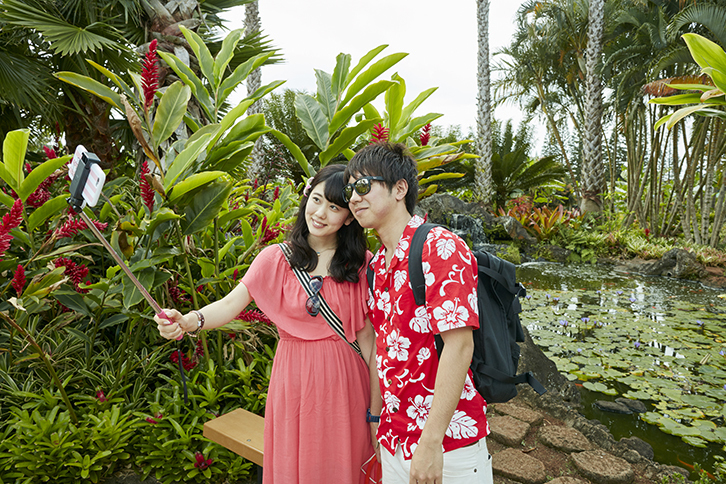 Today, the short-lived but beautiful flower lei is the most popular garland worn in the islands. Although anyone can wear any type of lei, different lei are sometimes made for men and women: kukui nuts, ti, or fragrant maile for men, and roses, white ginger, jasmine, or tuberose for women. Pineapples are famously drought-tolerant, but even a pineapple gets thirsty. To irrigate their fields, plantations on the islands’ vast, dry plains created networks of ditches and tunnels to divert water from flowing mountain streams, which were fed by the constant arrival of moisture-laden trade winds from the east. Pineapples are the most well known—and certainly the most delicious—members of the bromeliaciae (bromeliads), a family of plants that consists of nearvvvly 3,000 species and hybrids in a plethora of different forms, from tiny Spanish Moss to Puya raimondii, whose gigantic flower spikes can grow taller than a two-story house. In fact, the members of this huge plant family, indigenous to the Americas, are the most diversely colored and shaped botanicals in the world. Bromeliads caused a sensation when they were introduced to Europe as a strange plant from the New World, and they are still popular with gardeners today for their easy care and delightful foliage and blooms. The ti plant isn’t “tea” at all, but a member of the lily family with a distinctive cluster of large, glossy, dark green leaves on a stalk that can grow up to ten feet high. Ti is a “canoe plant,” or one of the few plants the first Hawaiians brought thousands of miles across open ocean to their new home. The leaves and roots of this important plant appeared everywhere in ancient Hawaiian life. If it rained, you might put on a ti leaf cloak. You might have eaten food cooked inside the strong, flexible leaves, or been blessed with a ti leaf in a sacred ceremony. In pineapple’s heyday, the working day of a plantation laborer began before dawn, six days a week. Workers, both men and women (and sometimes children during their school vacations) rose at 4:30 a.m. and waited for the plantation trucks that took them to the fields before dawn. There were many different kinds of work to be done. Land preparation, planting, fertilization, weeding and harvesting were all done by hand. A laborer’s day was finished by 4 p.m., when the trucks returned them to the plantation camp. A skilled laborer could plant more than 10,000 pineapple crowns a day. On Hawaii’s plantations, workers were usually housed in separate “camps” according to their nationality, a practice that helped the workers maintain a sense of community, continuity, and cultural identity. Within the camps, families celebrated the festivals, shared the foods, and participated in the traditional activities of their homelands. The Japanese camps held o-bon festivals in late summer, Chinese camps celebrated the Chinese New Year with fireworks and ceremonial foods, and the Filipino camps celebrated Rizal Day in honor of José Rizal, the national hero of the Philippines.